@lseltzer: Disturbing error message from IE8. 2. The scripts were written by developers who did not check them using multiple browsers. The browser throws an error when the CSS call fails. So the builders of the web pages that cause that need to be a little more thorough when the build. This info is exactly what I was after. But it happens on facebook - surely the people who put that site together know what they are doing? I get this error before I start up any browser! in fact, I don't ever use IE, only Firefox. When I restart or turn on my computer, these popups start almost instantly. ANy ideas? Thanks, but this error message is rather annoying. I just got this error message while in yahoo mail using IE8. Is this a bug? I only get this message when playing Farmville - either thru FB or thru their Farmville.com page. I use IE 8.
doesn't happen with other FB games, and ignoring it seems to work just fine. Just couldn't figure out what it meant. yahoo mail only, chrome or IE* what gives? I have three yahoo email accounts and I only get this message on one of them. My computer freezes and I am unable to close the "out of Memory" window. Have to turn off and restart the computer. It has made my main yahoo account unuseable. It happens to me only when I use Yahoo mail. Hi all, It only happens when I use Yahoo mail, but how do I get rid off it ????!!!!! It happens on both our email accounts and is difficult to remove and sometimes goes into "not responding"
Only happens to me on Yahoo mail; never happened till I upgraded to IE8. In my yahoo mail account but couldn't find the way to rid of that...any solutions ???????? Only happens to me on yahoo mail as well. 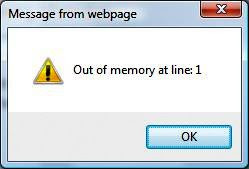 It says out of memory at line 1. Very frustrating. Why doesn't yahoo fix this? HOw can i fix this? SO, how do we fix this problem, didn't see that answer anywhere. Now I get messages "out of memory at line:1" and "out of memory at line:2"
From "out of memory on line one" we are now getting "stack overflow at line 131"
Any one know what to do?? ok the problem that everyone is not understanding is that when using facebook/yahoo/ect..... its not that particular program that is causing the errors it is the server or browser your using that allows the app to run facebook is concidered an app and so isnt yahoo. if it keeps happening over an over try downgrading to an earlier internet explorer then upgrading 9 timmes out of ten you will gain the missing file or the file will fix itself. Ok so I need to go back to a different version? I just hope you've found this post before you've spent your money on "cleaning" programs to fix this it will not work. YOU ARE NOT OUT OF MEMORY BUT IF YOUR COMPUTER IS USING OVER 640 MB OF RAM FOR EACH PAGE FILE YOU WILL HAVE A VIRTUAL MEMORY PROBLEM. 7. See your virtual memory? Is your paging file size bigger than 640MB? If it is, change it to 640MB. If you are impatient, download mozilla firefox (free) and use that. Facebook was still giving me problems after I fixed my RAM, but not as bad, so you might want to stay off it for awhile. I use it everyday now. An error message without a recovery procedure is a design error. So, yes, there is a problem here. Hmmm, doesn't it figure it happens with AOL!! Been getting Similar problems"Out of Memory at line 1" on a Windows 8.1 Phone! From What Read in here.. Gather it Isn't Malware Nor a Virus? it happens on realplayer and stops the burning process. what do I do? Been running a Windows 8.1 machine with an 8 core processor and 16gb RAM. Never saw this problem in the 18 months it has been running. Did the upgrade to Win 10 and this error is now there extremely often and I have a "browser search line" at the top of my main monitor, one of 4 monitors I have on this machine. I cannot find where to get rid of this "guest browser search bar"
happens to me on windows 7, Vista, facebook, MSN, Also Windows 8 plus same as before, also Windows 10 with prev details! I have the problem with Win10, but normally I get several of the small error screens stacked on top of each other. It's like playing whack a mole trying to close them. If I go to C A D it shows 32 bit system not responding, I think all I have is a 64 bit system with Win 10. If I highlight 32 bit system and then end task windows closes and I start the dance all over again.